The early access version of Take on Mars has received a new update today offering new areas to explore and new technologies to send out on missions where millions of dollars of equipment will no doubt be destroyed due to a small, seemingly insignificant calculation. The new areas ripe for exploration are Deimos, one of Mars’ two moons, and an asteroid belt in deep space, located between Jupiter and Mars. 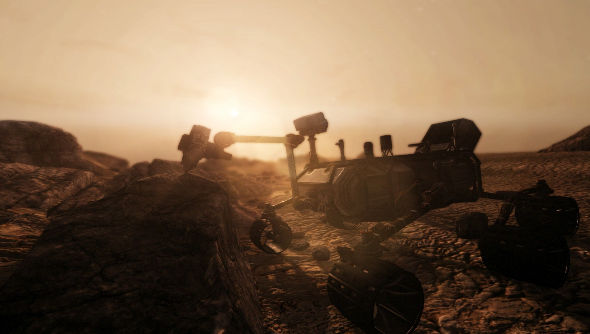 On the surface of Deimos you’ll be able to pilot a Rover into three large craters, each spanning a kilometer across. Alongside the two new areas, the new content update introduces the Zero-G Probe, a vehicle for gravity-less environments well suited to Deimos and the asteroid belt. You’ll be able to head off on missions created by the new Dynamic Mission Generator, which randomly assigns tasks based on your location. The whole act of discovery will also be made even more immersive with weather, such as sandstorms. Take On Mars is currently available in Early Access form from Steam.